This vintage tin (Huntley & Palmer's Assorted Biscuits) was in a bag of "curb-side" finds from a house being cleaned out. It was in with piles and piles of Irish lace and linens - all carefully saved for decades then tossed by the relations cleaning the house for sale. Of course I asked if it was OK to pick them - and once I got the, "Sure, help yourself", in the truck went the bags! Once I had sorted through all the bags (wonderful stuff!) I went back to the tin, which I had set aside, to read through the letters - and read I did! 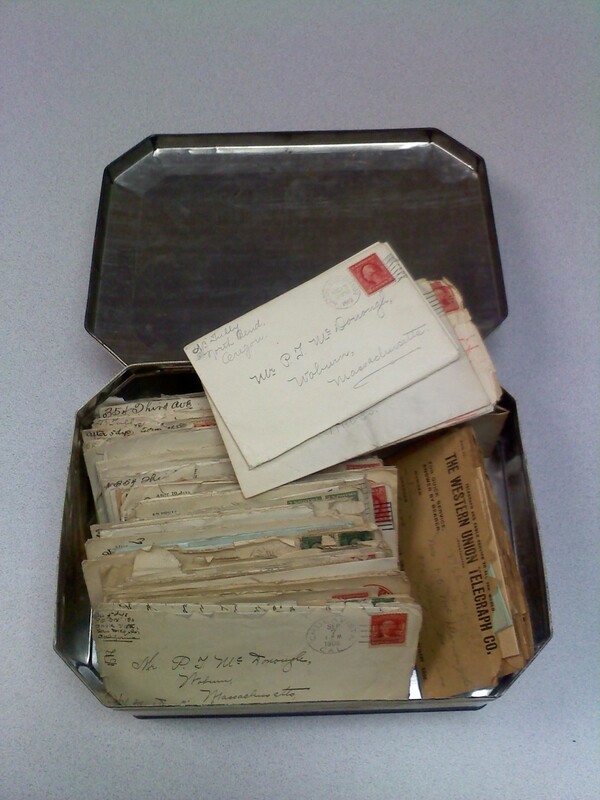 Seems I had a bit more than just your average old letters and telegrams from the early 1900's. My biscuit tin contained an love affair! A pretty torrid affair by early 19oo's standards I imagine - he was single and from a well known family in the city, she was married and it seems of very questionable character and then.......well I won't give it all away now, you'll just have to check back! When I originally read them, pre-blogs and the like, I saved them not knowing exactly how I could share this story, until now. I am finally undertaking the tedious process of transcribing the letters and putting them in chronological order and will be posting the story here as I go along. How wonderful! I can't wait to read their story! How amazing! I love finding things like this. Goes to show you, people haven't really changed all that much. But it's much juicier when it happened so long ago - before women were liberated and when things like an affair were really & truly covert. How exciting!! Thanks for sharing, can't wait to hear more. When do we get the next installment??? Pansy wrote back and Alice was thrilled!! 2011 GirlieGirlVintage. Travel theme. Theme images by enjoynz. Powered by Blogger.